Buy your admission tickets here! $40 per person. 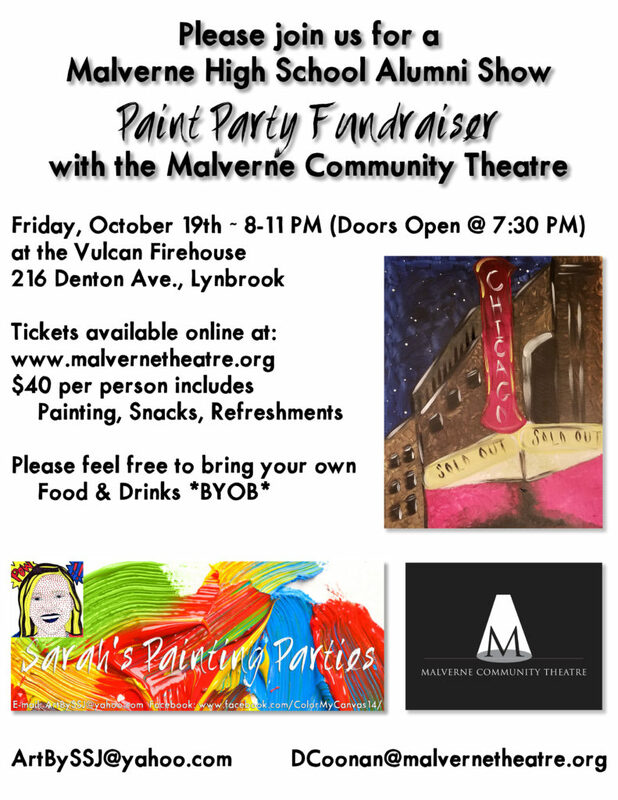 Join us for a Paint Party fundraiser to raise money for the Malverne High School Musical Theater Alumni Show presented by Malverne Community Theatre! Guaranteed to be a fun evening full of art, food, and drink – and the best part is that all of the money raised goes directly to help produce this unprecedented production. See the flyer for details. Bring your drinks, bring your food. We’ll provide all of the art materials. MHS alum Sarah St. John will provide the instruction to help you create the painting on the flyer above. We’ll also provide light snacks and non-alcoholic drinks. There may also be a 50/50 raffle and some entertainment from the MCT improv troupe! Price is $40 per person. We hope to see you there!